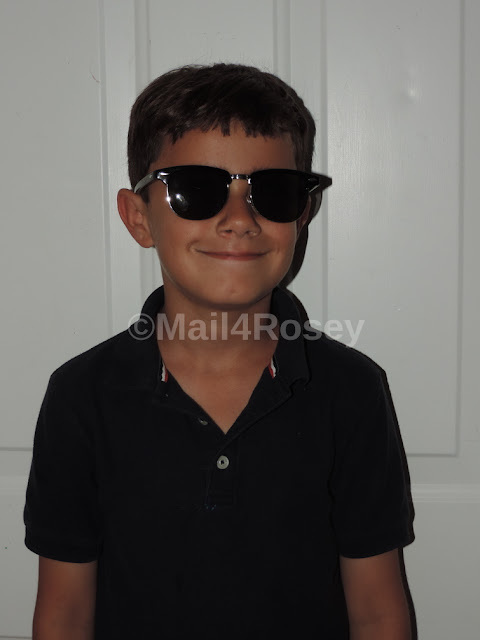 Mail4Rosey: Sunglass Warehouse: Quality Sunnies for Adults that Look Great and Don't Cost a Fortune! Sunglass Warehouse: Quality Sunnies for Adults that Look Great and Don't Cost a Fortune! Thinking if he looked cute enough he might get to keep the sunglasses. 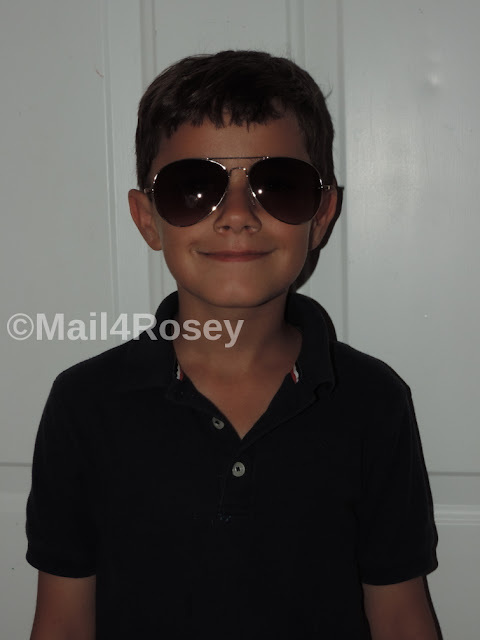 We got a package from Sunglass Warehouse, and my son got permission to open it and see what was inside. "Which pair do you like best, Mom?" That's what he asked me when he was trying on the sunglasses I got for his two older brothers. Clearly both pairs were too large for him, they are made for adults. ;) The Whistler pair you see in the picture above? Just over $10 and they come in a variety of colors (frame and lens color choices). I like these, and was 'this' close to keeping them for myself, but I haven't done anything nice for the big boys lately. They both love sunnies, so I thought these would be perfect. Here you see the Admiral Aviators. Again just over $10 and you can get the colored lenses or you can select the mirrored ones. I thought my second oldest would like these. I've seen him in aviators before. It wasn't my oldest son that ended up with the Whistlers though. See the gal on the far left? Mmm hmm, she looks great in them, and she claimed 'em on the spot. So my gift for the boys, turned into a gift for one of my boys, and for his gal. Fine by me, we like to spoil the girls in the family a bit too. ;) No worries about my oldest, as you can see from the pic above, it's not uncommon for all of them to be donning their shades. It is Florida, and it does get hawt. Gotta protect those eyes, might as well do it for the great prices you'll find over at Sunglass Warehouse. SHOP NOW AND GET A DISCOUNT ON ALREADY LOW PRICES! Head on over to Sunglass Warehouse where you can get quality shades for VERY reasonable prices. If you hurry, you can get 15% off with the code SAVE15. You can also get free shipping on orders over $25 (expires July 16, 2016 at midnight ET). Visit the website to see all of the great styles for sale. You can also follow along on Facebook and/or Twitter. You have such a wonderful family! The little guy isn't so little anymore. 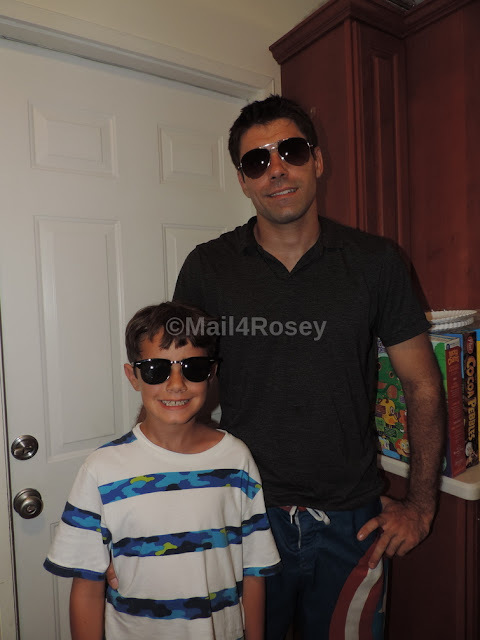 Look at all your handsome boys in their shades! I am usually a fan of the aviators, but those Whistlers are pretty spiffy too. 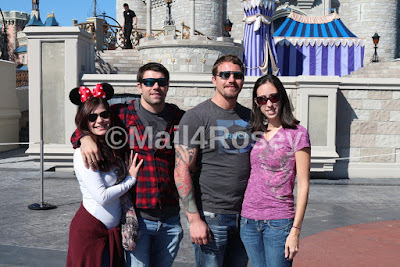 They all look so cute with their glasses! Aviators are my favorite, I think I'm gonna get one of those for my husband. Oh, he is so handsome! I remember my step kids, they like wearing sunnies too! Aviators always win out for me at my sea. That's a really good price too. Way cool looking sunglasses. Your sons are handsome. Your kids look so alike! Little man is definitely growing up! Your youngest son really looks a lot like your older son. The glasses look great Rosey. Hope you are enjoying sunny Florida! I happen to prefer low cost sunnies most of the time. They are just as good as some of those over expensive ones. Sunglasses aren't just for style, although it helps if they look really fashionable! This summer it's important to have a good pair of sunnies with you every time you go out! These are amazing! I love the Admiral Aviators. My head big so big, they are the only kind of shades that look good on me. you are awesome to surprise them like that! hahha that looks so cool! i love that it doesn't cost a fortune and still looks so damn awesome. Oh my goodness he's Mr. Cool! You are raising a handsome boy there. They both look handsome! I like the design of the first one.